Building on its expertise with arc and induction melting systems and the past experience of its engineers in the field of gas atomization, Arcast has introduced gas atomization systems into its range of products. 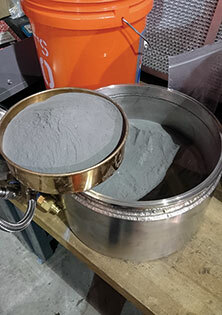 We focus on the specialist end of this technology for the production of powders from refractory (high melting point) metals and those with highly reactive melts that have, in the past, proved problematic using conventional methods and materials of containment. 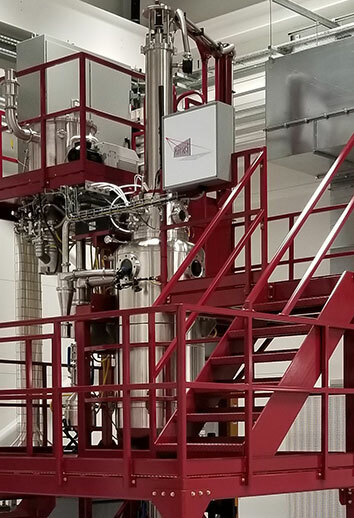 We manufacture systems tailored to our customers' specific requirements for the production of the cleanest and finest metal powders that can be achieved within the constraints of the process physics involved and the limitations imposed by the materials themselves. 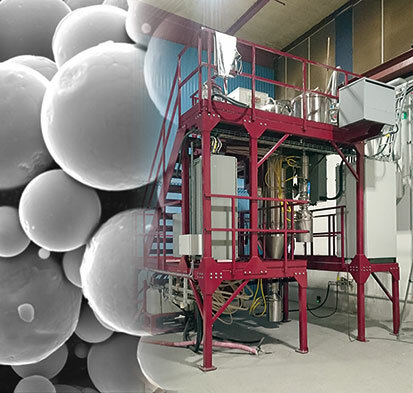 Our system designs optimize production of powders displaying the most consistently spherical morphology, and with the least tendency to 'satellite' formation. These characteristics allow powders to flow more freely and achieve increased packing densities, desirable for the optimization of such increasingly important manufacturing techniques as metal injection molding (MIM) and additive layer manufacturing. The size and type of vacuum system can be chosen according to the speed of pump-down and depth of evacuation desired. The size of atomization chambers is usually determined by the flight length that is required to ensure solidification of atomized droplets before they contact the walls or base of the vessel. 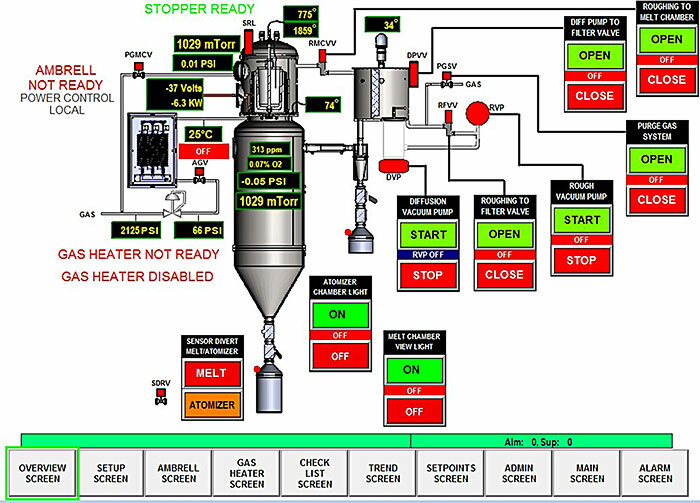 We do, however, manufacture our systems to be as compact as possible within the constraints imposed by process. 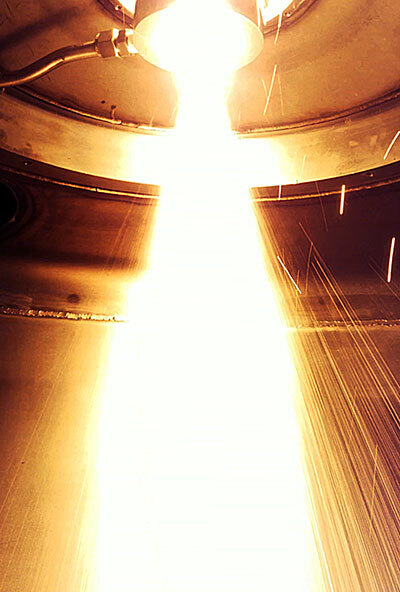 Arcast can offer a variety of atomization options aimed, principally, at producing powders from reactive and/or refractory melts. Melting can be conducted under vacuum or controlled (oxygen free) atmospheres, and usually by means of induction melting using either conventional, ceramic refractory crucibles and guide tubes or by means of contactless, 'cold crucible' arrangements. Our gas atomizer products range from 5-200kg conventional batch type ceramic/refractory based close coupled gas atomizers to free fall atomizers for reactive metals like titanium. 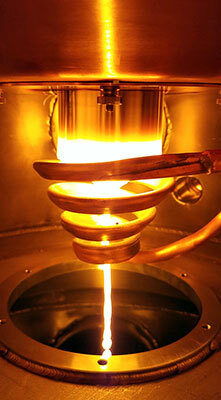 Performance is key, so we offer quick change crucibles and gas heating options for improved performance. Left and bottom, induction bar feed gas atomizer for titanium powder, ready at the time of the photo for powder coating, showing the structure and test run.